I wanted to talk about David Bordwell's posts here and here when they were a little more current (as in, last week- time flies on the Web.) The first one examines scenes from two different films- Shanghai (2010) and Tampopo (1985), in which characters enter a room and sit down. Shanghai, directed by Mikael Håfström, of 1408, uses over a dozen shots, including various inserts of props, like a telephone, before the two central characters settle into chairs and deliver their lines in over the shoulder shots. Tampopo, directed by Itami Juzo, uses fewer shots that do a whole lot more work: As the heroes enter a restaurant, cuts to glowering thugs not only foreshadow the upcoming fight scene, but also lay out the geography of the room. DB has lots of still frames, so check out his blog to see exactly what he's saying. Bordwell also links to this post by AD Jameson on what he doesn't like about Inception [ref] While I didn't hate it, Jameson's criticisms are very valid. [/ref]. In item number 5, he looks at the opening scene, which consists of- count 'em!- 13 shots. Several of them are redundant- do we need two different views of waves hitting rocks? We're at the beach. Okay, let's move on. Jameson takes another look at the scene, and decides it could show the same information in half the shots. 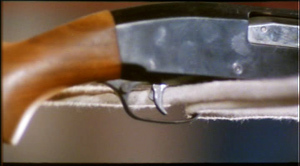 The second post looks at several action scenes from Hong Kong films that Bordwell talks about in Planet Hong Kong. He compares the fluid, "over-the-top" style from Hong Kong with the more visceral, less coherent approach of the later Bourne films, and The Expendables. If you can't tell where Jason Bourne or Sly are in relation to the guys they're beating to a pulp, well, that's intentional. But DB argues that Hong Kong filmmakers can deliver the same punch with... gracefulness. There is what we call the Hollywood Style. . . . . Master shot [filmed] from the very beginning [of the scene] to the end, then a close shot from beginning to end, then from angles A and B, cutaways, etc. Then all of the materials are assembled later in the editing room. But in Japan, the editing plan is prepared before shooting. When you cut, it’s a matter of trimming heads and tails and just putting it together. Three days after the end of filming, there is a rough cut of the film. Personally, Itami's method is closer to how I think about things when I plan a shoot. I've always worked like this- shooting lots of footage and deciding later what you want doesn't make a lot of sense to me. Of course, the visceral-chaos approach to action scenes is widespread and very popular at this point- in a future post I'd like to take a stab at figuring out why. If you have a guess, please, let me know. Another thought I'll leave you with is Bordwell's observation that Hong Kong action scenes don't have wall-to-wall, non-stop violence. It comes in short bursts, followed by stretches of stillness where not much happens. What does all this have to do with sine waves, psychology, and music that's poorly mixed? Come back soon to find out! Andrew's Blog- Now in 3D!